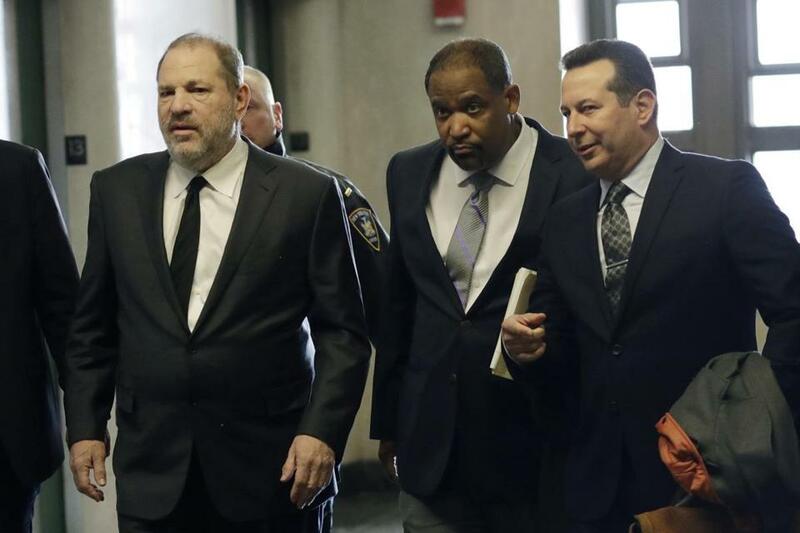 Harvey Weinstein (left) went into court last month with Winthrop House faculty dean Ronald S. Sullivan Jr. (center). CAMBRIDGE — To witness all the tumult, you might think Harvey Weinstein had just moved onto Harvard’s campus. But the news that the disgraced Hollywood producer has chosen for his legal “dream team” a faculty dean of one of Harvard’s residential houses has unleashed a wave of concern on campus. 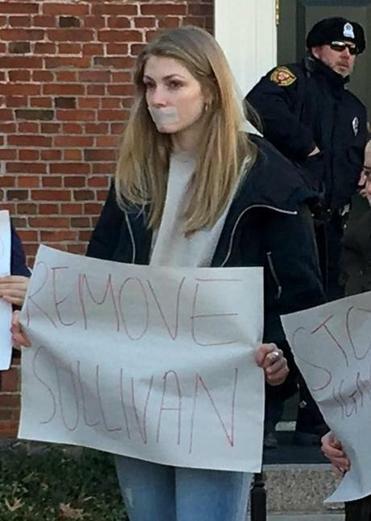 Holding signs that said “Harvard Doesn’t Care” and “Down with the Dean,” students protested outside the president’s office in Harvard Yard on Monday, demanding that the administration immediately remove Winthrop House faculty dean Ronald S. Sullivan Jr. from his position. Sullivan, who teaches at Harvard Law, lives in Winthrop House, one of the dozen residential buildings that house almost all Harvard undergraduates. But since late last month, he’s also one of the criminal defense attorneys representing Weinstein, the Hollywood producer whose name became synonymous with sexual misconduct and professional malpractice in 2017 when legions of film professionals began making their accusations public. High-profile cases are not new for Sullivan. He helped win an acquittal in the double-murder case against former New England Patriots player Aaron Hernandez in 2017 and he previously represented actress Rose McGowan — one of Weinstein’s fiercest accusers — on a drug possession charge. Nor is he a stranger to controversy, having represented the family of Michael Brown in a settlement with the city of Ferguson, Mo., over their wrongful death claim. And last year, he represented a Harvard student whose forcible arrest, while he was naked and delusional, raised public concerns of police brutality. Sullivan was a faculty dean during all those cases, too. But Weinstein, it seems, is another matter. “This is about someone who is in a pastoral role — who we’re supposed to feel safe and supported with — literally protecting the person who started the #MeToo movement.”said Madeleine Woods, a survivor of sexual assault who lives in Winthrop House. Students and even some faculty have been raising concerns since the Harvard Crimson student newspaper began reporting on the flap at the end of January. And some have questioned the judgment of a faculty dean, who will sometimes hear students’ own accounts of sexual assault, moonlighting as counsel for the most famously offensive accused offender in recent memory. “Is it good judgment to undertake such a high-profile defense?” Diana Eck, a religious studies professor who serves as faculty dean in another house, said at the protest. She said a reconsideration of faculty deans’ roles may be in order, even though she noted that she believes every defendant, however unpopular, has the right to legal representation. But a Harvard Law graduate taught by Sullivan said the students are mistaking the attorney’s role. “Do you really think that lawyers are an extension of the criminals they represent?” she asked. The woman, whose name is being withheld at her request since she is a survivor of sexual assault, said Sullivan advocated for her personally, encouraged her to pursue an assault charge, and offered to handle her case pro bono. He has done the same for other women at Harvard, she noted, often taking up the case of the accuser rather than the accused. And, she noted, in law school he was known for encouraging students to practice both sides — as prosecutor and defense — often trading the roles himself. Sullivan declined to speak for this story. In an e-mail he circulated to students, obtained by the Globe, he noted that America’s legal system rests on a presumption of innocence and the right to effective representation. In the e-mail, Sullivan noted that he has secured the release of many people who were wrongfully convicted, some of whom served decades in prison for crimes they did not commit. “The US criminal process teaches us that the system only works if we defend those whom we perceive as guilty, as vigorously as those whom we perceive to be innocent,” Sullivan wrote. But some of the students objecting to his role say he is no mere lawyer, but a mentor — and as counsel to Weinstein, they are suddenly questioning his allegiance to them.